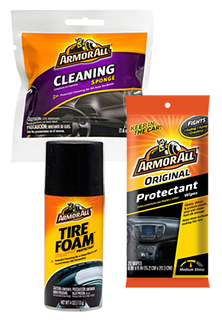 Vending sprays, sponges, and wipes are perfect for on the go cleaning in your car. We have several brands including Armor All, Blue Magic, Just for Leather and more. These sprays, sponges, and wipes are for glass, leather, dash, and more. Come check out our wide variety of vending sprays, sponges, and wipes for your everyday car cleaning needs. We have the lowest prices in the nation. GUARANTEED!